The GSP+ going through is no doubt a big victory for Sri Lanka given the many challenges the Government has been facing in the last few months and the negativity surrounding it. The Prime Minister needs to be congratulated for his efforts to restore the GSP+. Those responsible for managing exports and the private sector now need to get on with it. It was less than 30 months ago when many right-thinking people watched with alarm and disappointment the steady decline in the moral values of our nation with politics for material benefits overtaking our cherished values. The breakdown of our religious values, traditions and culture, the level of politicisation of the public administration reached new heights, which led to nepotism, bribery and corruption never seen before in our history. The election of President Sirisena gave Sri Lanka an opportunity for real change. Many people hailedthe election of Maithripala as a victory for liberty, justice and democracy, as against autocracy and nepotism. The new Government went out of the way to protect the newfound political and social freedom. The only major hiccup being the bond controversy. We Sri Lankans unfortunately have very short memories and have no patience. Many want the Government to deliver like yesterday. Many people are slowly getting disillusioned with the style of governance, largely because the Government has done very little to educate the public about the challenges the Government is facing and the negativism largely driven by inaction and some people in authority not knowing what their roles and responsibilities are in the administration. As a result, to the diehard supporters of Yahapalanaya, these are days of fading hope and overwhelming despair and those who toiled hard for Yahapalanayaare slowly giving up and many of them are openly venting their frustration on social media. Therefore, it is important that the people who have put their future in the Government, are not let down by an underperforming government and thereby undermine the 8 January mandate. Moreover people are now lamenting the Government has no backbone to deal with emergencies. Therefore President Sirisena’s move to bring back former Army Chief Field Marshall Sarath Fonseka to take over the military as commander or Chief of Defence Staffin order to bring “discipline” to the country is a move in the right direction. 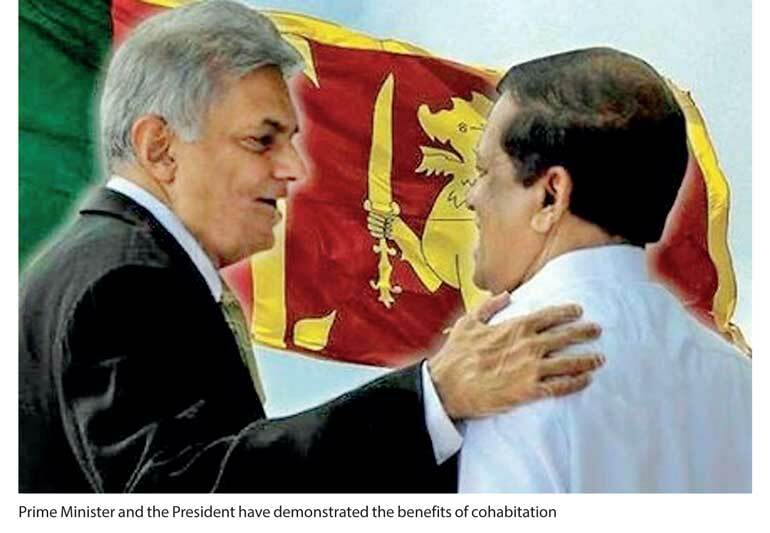 Post 2015, the Executive Presidency in Sri Lanka was strengthened by the dictatorial powers added on by the 18th Amendment.As a result the entire State administrative machinery of the country in all aspects of functioning was politicised beyond redemption. The 18th Amendment not only led to a gradual and systematic destruction of liberty and democracy, but also destabilised the economy by creating an opportunity for corruption and free spending of public money without accountability, destroying the very social fabric of our society. The Sirisena Government passed the 19th Amendment in record time and that paved the way to establish law and order and an independent public service. The promise to establish an accountable parliamentary system, strengthening democracy with accountability and transparency, was delivered after 18August 2015. In addition the Government worked tirelessly to restore human values, human rights, rule of law, decency and economic freedom. The question now is, has the Government gone overboard and created a culture of indiscipline and lethargy? The general view is the Government needs a rapid and major course correction. They need to learn from the US elections last year. The lessons: stop taking progressive voters for granted and make challenging the status quo a top priority. People are seeing the Government policies are not “change” but a continuation of the past. Rather than challenging the cronies and poorly performing public servants the Government is seen to be rewarding them. Priorities for the Government should be, debt management, health care, housing and jobs. The UNP and SLFP should not take their voter base for granted assuming they have nowhere else to go. They will pay a hefty price, and the price will get higher if they do not learn the obvious lessons: excite your base, challenge the bureaucracy and business and demonstrate the change in direction by re-making the Government. The Government needs to reach outside, to get a clear reading of the mood of the country. From most of their appointees theywill not hear the rightmessage. It is time to clean the house, re-start and set a new direction more consistent with the President’s promise to change the way Government operates and delivers on the promises made. If the President and Prime Minister wantto really bring hope and change, they need to become progressive populists. The Government in the remaining three years needs to ensure steady and balanced economic growth with in a conducive environment that will help to create new job opportunities, develop agriculture, industry; and reposition our education and skills development effort. Housing for the homeless and empowerment of the socially marginalised and disabled including war victims should also be priority concerns. Creating a conducive climate to do business, to rebuild business confidence amongst investors, both locally and internationally must be a top priority. By continuing to depoliticise the system a lot of the demotivated business leaders can be rejuvenated and re-energised. The stock exchange must supported to ensure the exchange attracts genuine investors and also provide opportunities for a broader group of investors to benefit by investing in the stock exchange. To ensure this the Government should only act as a facilitator and that requires better regulation and governance. The message that is required is that business will only be done by the private sector and the Government will provide a level playing field and provide long-term investment friendly policies that will benefit all businesses, irrespective of their affiliations. Therefore many regulations and tax and fee structures that are perceived, as a deterrent to investment and doing business must be removedvia a consultative process between the public and private sectors. The Government needs to work smart to restore the GSP+. Special emphasis also needs to be given to the welfare of the weak, disabled, the elderly and the unemployed, as well as environmental conservation. However to do this it is important that people with the right competence and credibility are appointed to key Government positions, the mistakes of the past should be avoided. Those secretaries and head of public institutions who have failed miserably must be removed immediately after an objective performance assessment (survey results of non-performing State institutions are readily available on the web). The Government today is on the wrong side of a battle between certain Government cronies and voters. In the final analysis, the Government is going to have to make decisionsfast to set a new direction for the administration or willcontinue to be seen as a weak and unsuccessful Government.The two leaders need to really challenge the administration head on and also the ministers without killing any more time, next rally the people and make real reform to get on the side of the people once again. Both leaders have the capability and the will to change course to deliver a performance-oriented Government.